Marilyn Manson spoke to Dazed about his upcoming album, "SAY10", which is tentatively due in February 2017. According to the shock-rocker, the material for the follow-up to 2015's "The Pale Emperor" was once again written with composer Tyler Bates while the latter worked on the score for "Salem". "Tyler and I did it over the past three months, right before [Manson's] tour [with SLIPKNOT] started. It is, I would say, the last thing people would expect after hearing the previous album, 'The Pale Emperor'. And it's also, coming from the people who I've played it to, a combination of 'Antichrist Superstar' and 'Mechanical Animals' in feeling." He continued: "I generally take the opinion of girls over guys, because you usually make songs to make girls like you. That's why you start a rock band. It's inspired by all those things you do to make girls like you, all that passion and melodic pageantry, like [David] Bowie, but also the utter disregard for rules, like MINISTRY and all the bands that shaped the first album I made." Manson added: "It wasn't my intent to go backwards. Everything goes in a full circle and it just becomes, without cannibalizing work from the past, the same thing, which is ultimately you. "I'm a little over-anxious to release it, so it was done very quickly, but it is by far the most thematic and over-complicated thing that I've done. In a way, it's deceptively delightful to strangers. It's sort of like the old saying that the devil's greatest secret is that people don't believe he exists." 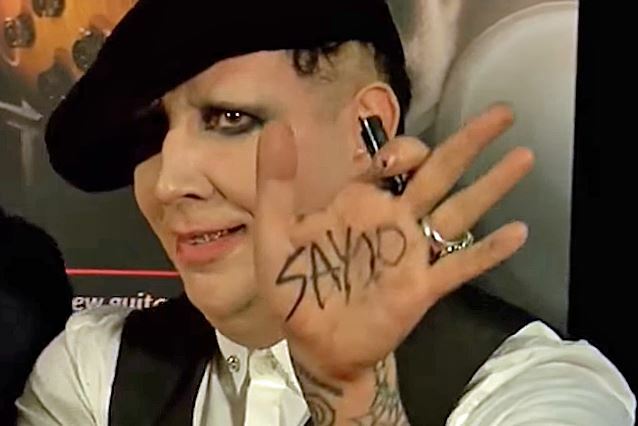 During an interview at the Alternative Press Music Awards in July, Manson stated about the "SAY10" album title: "It's not even a pun. It's worse than a pun. It's wordplay."